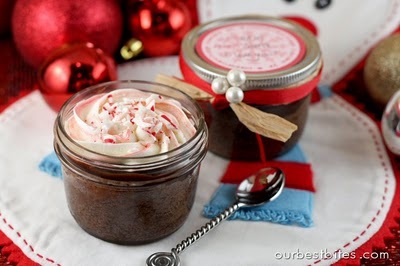 ﻿These cute little Cupcake jars are fun to give anytime as a little gift. Birhtdays, I'm thinking of you, anything! They are easy, but can be a little time consuming, so doing them in stages is best. First make your favorite chocolate cake mix. Fill about 8 jars no higher than 1/2 way (no need to grease the jars). They will rise, and you need room for the chocolate ganache layer and the frosting no higher than the rim so you can put a lid on it. Place jars on a cookie sheet and bake in 350 degree oven approx 20-25 minutes till done. let cool. 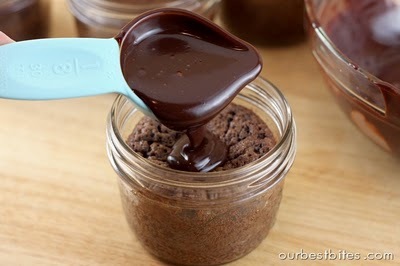 While jars are baking, make the chocolate ganache so it will cool while the jars are baking and cooling also. Place chocolate chips in a bowl. Heat cream in microwave until bubbles form around the outside. Pour in bowl over chocolate chips and immediately cover bowl with plastic wrap. Let sit for 5 minutes, add peppermint extract if desired and then whisk until smooth. Let cool un-covered until thickened slightly, almost like a thin pudding. spoon in approx. 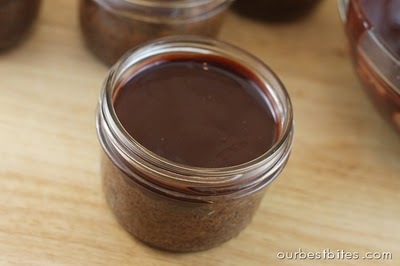 1 1/2 - 2 Tablespoons chocolate ganache (can warm ganache slightly if too thick). Next step, let ganache/cupcake cool completely. If finishing tomorrow and storing over night, make sure you put the lid on the jar at room temperature. Pipe or spread the frosting on top of ganache layer. 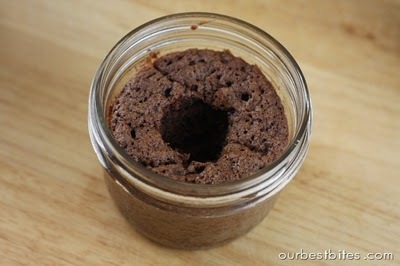 Start piping in center and work your way out, making sure not to go above the rim of the jar. Sprinkle with crushed candies or sprinkles. If want to create a slight striped look to the frosting. 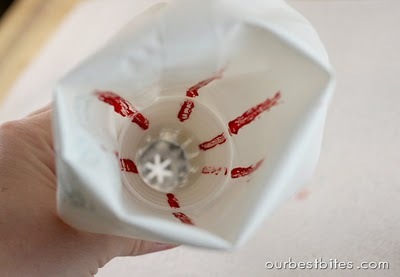 Paint food coloring gel in lines on the inside of the piping bag from tip to top around the inside of the bag before filling with frosting. Final step: when done with frosting put on canning lid and ring and embelish with cute to and from sticker on top of lid , Click here to see where I got the idea from! ribbons around jar,etc. Jans final tip: Collect these little half pint canning jars whenver you see them at yard sales, thrift stores, etc.